January 21, 2019 - Updated 3 p.m. with comments from Legislature Chair Kevin Whitney. 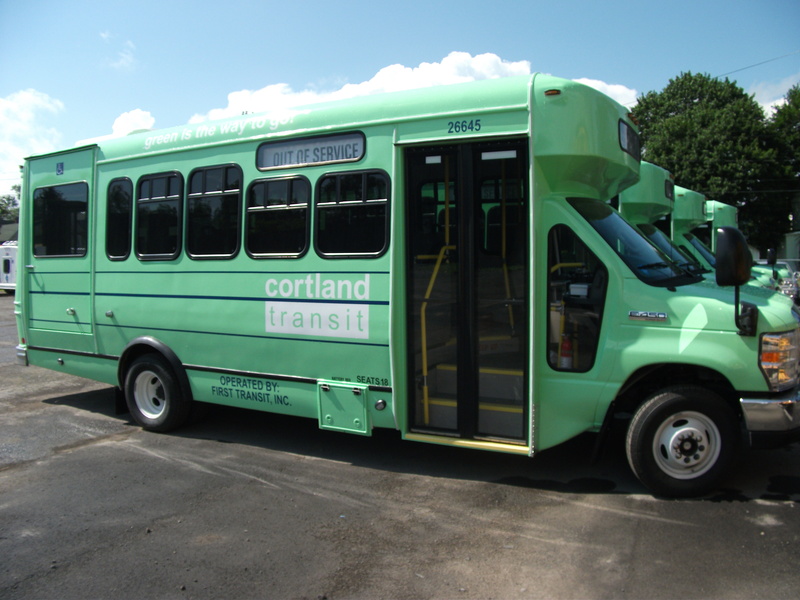 CORTLAND, N.Y. — Since 2009, Seven Valleys Health Coalition has worked in cooperation with Cortland County to identify ways to improve its public transit system. That 10-year relationship may come to an end after the Cortland County Agricultural, Planning, and Environmental Committee passed two resolutions at its Jan. 10 meeting by a 4-2 vote to rescind the county’s agreement with the coalition and transitioning “mobility management services” to the County Planning Department. Legislators Sandy Price, Christopher Newell, Michael K. Barylski, and Joan Coombs voted in favor of the proposal, while Donnell Boyden and Beau Harbin voted against it. Legislator Douglas Bentley was absent. That resolution is expected to be voted on by the full legislature at its next meeting on Thurs., Jan. 24, at 6 p.m. at the Cortland County Office Building, 60 Central Ave., Cortland. Under the most current agreement between the two organizations, which expired at the end of 2017, the coalition agreed to provide mobility management services to the county, which includes answering phone calls and logging complaints from riders, redesigning bus route maps, improving GPS technology, identifying additional sources of revenue, and improving the public image of the bus service. First Transit, Inc., is responsible for operating the services. The mobility management services are funded through state grants, and the county has contracted out those services to Seven Valleys Health Coalition since 2009. The county also contracts with First Transit to provide bus services to local residents, though the service is funded through state and federal dollars, as well as revenue earned from fares and advertising. The county does not provide direct funding for its public transit services. Jackie Leaf, executive director for the coalition, says the organization has been operating the mobility management program without reimbursement since February 2018, when the previous grant funds were exhausted. Although the current agreement expired in March 2017, SVHC continued to operate the mobility management program and received reimbursement fo the program through the county until mid-February 2018, when thew previous grands from a 2015-2016 award were exhausted, Leaf said. The 2017-2018 grant award announcement came out at the end of June 2018, so the coalition operated at its own risk from February 2018 until July 2018. "Since July, we have had every reason to expect to be reimbursed," Leaf said. The coalition first learned in November 2018 that the county was planning to no longer contract with them. On Nov. 7, 2018, Leaf received a letter from Legislature Chair Kevin Whitney stating that the County would be ending its partnership with the coalition effectively immediately and would be unable to reimburse the coalition for costs incurred after March 2017, when the most recent contract ended. Upon receiving the letter, Leaf questioned whether Whitney had the legal authority to make such a decision without the approval of other legislators. The coalition decided to consult an attorney, and Leaf crafted a letter of her own, though she received no response and discussions have stalled since then. The state announced in July that the county would receive the grant funding retroactively for 2017-2018, but the county has not yet received the contract. Whitney expressed concern over this issue in his letter, but Leaf says a lag in receiving grant funding is not at all uncommon. Whitney, however, still contends that the funding for the coalition is simply not available. "This is my third and final attempt to make it clear: There's no money. There's no contract," Whitney said in a phone interview Monday afternoon. "We're uncertain where we stand." Leaf said the loss in grant funding would ultimately hurt the organization as a whole. She says the organization has a filed a grievance with the State Comptroller's Office with a request to receive the mobility management funding directly from the state. “The county’s consideration of not reimbursing us once they receive the grant funds from New York State is irresponsible and could inflict tremendous damage on the future of our organization and the services we are able to provide the community,” Leaf said. When asked his opinion of the coalition's handling of the mobility management program, Whitney declined to comment, saying he is not allowed to speak on that matter in light of the coalition's grievance filing. Whitney said the county has encountered a number of issues with First Transit, including routes not being followed and reports of students being stranded at Tompkins Cortland Community College. "This has become a huge issue," Whitney said, adding that the college is working on fostering a meeting between Cortland County, Sen. James Seward, Assemblywoman Barbara Lifton, and First Transit, to try and resolve the issue.